I had a hard time believing this was only the second year of Tea Fest PDX. 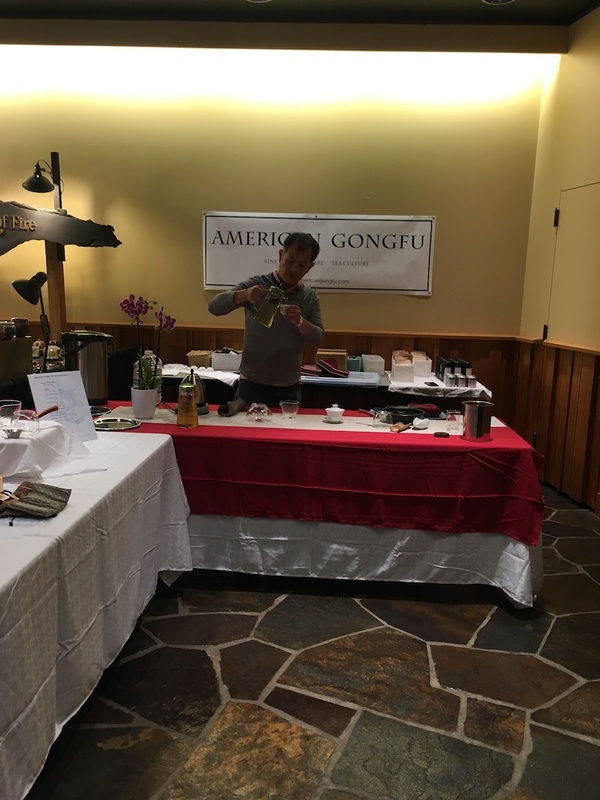 The event featured dozens of vendors both local and from further afield, a full slate of classes covering everything from English tea traditions to comparative tastings of Wuyi cliff teas, and musical performances all day. Over 3,000 people attended the event, held at the semi-rustic World Forestry Center in the hills to the west of the city. Eric Suen of Yunwei Tea educates a small crowd on his speciality - Wuyi yancha (cliff tea from the Wuyi mountains). Eric is also a Bay Area tea friend - we had a great time road tripping up to Portland together! You can see the music stage in the background. The combination indoor/outdoor venue allowed for ample meandering and featured dozens of little eddies of activity so you could always find a quieter space to enjoy tea. 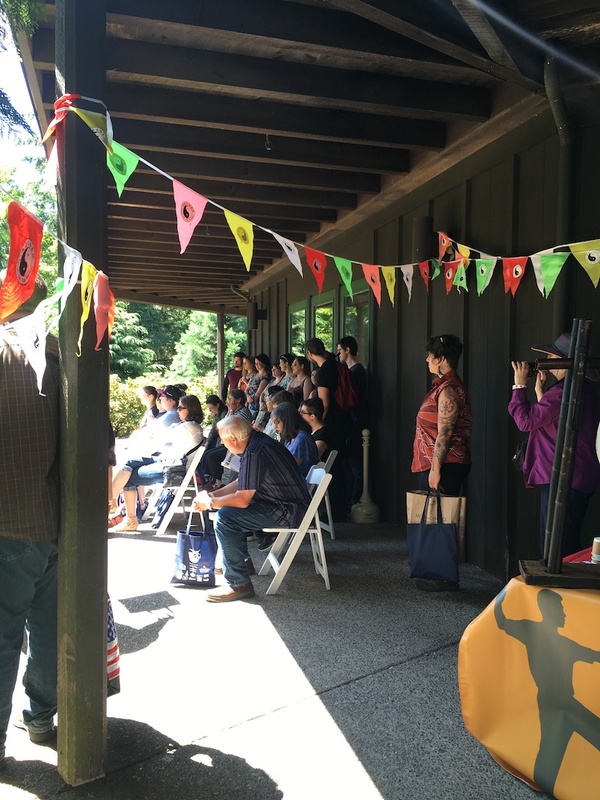 The venue was spread across three main areas - a large outdoor tent featuring vendors mostly serving tea gongfu style, a building with a more table-top style expo, and another building where classes took place with some additional exhibits and classroom areas outdoors. Outdoor class drawing a nice crowd. 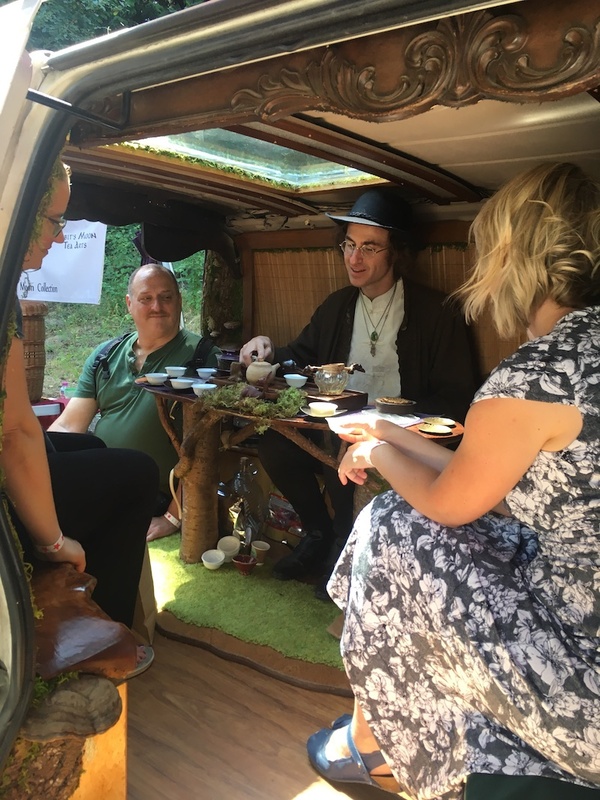 My favorite are of the event was a liminal space underneath two evergreens served as a converging point for a few mobile tea vehicles including Omar Riverstone's Jasmine Dragon CommuniTea wagon and the work-in-progress Rabbit Moon Tea Arts van. These mobile tea spaces were beautifully appointed refuges from the more buzzy vending areas and invited people to slow down and enjoy the bubbling kettles and the quieter company of other in true "tea people" fashion. 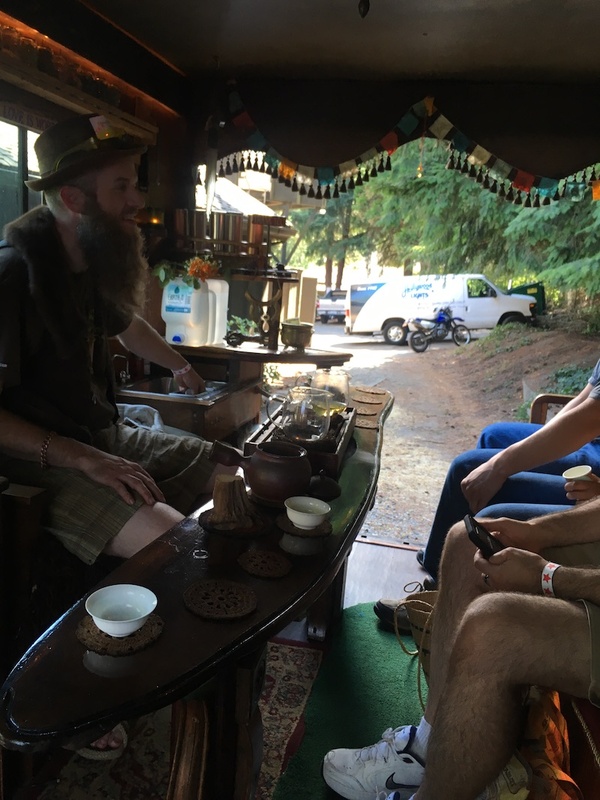 A few other tea makers, such as Glen from Crimson Lotus Tea, set up nearby the vans without much pomp or circumstance and just simply shared new teas releases like their "Intrigue" sheng cha while socialing with folks. Steve Odell in his happy place entertaining a small group at his work-in-progress tea van. I had the pleasure of helping my East Bay tea friends James and Jason with their booth, American Gongfu. 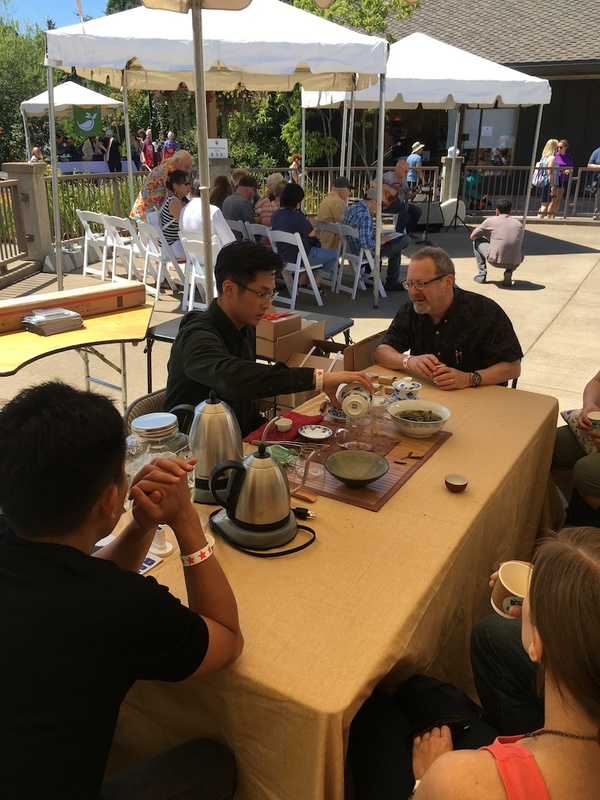 They import beautiful and scrumptious Taiwanese teas, which gave me the opportunity to interact with a wide variety of festival attendees and get a feel for the maturity of the Portland tea community. Jason Young of American Gongfu sampling cold brew Boazhong before the festival participants descended. Given the number of bigger tea brands in the Portland area (including Steven Smith, Townshend's, and Jasmine Pearl), I was not terribly surprised that many people were starting from a good baseline of general knowledge about whole leaf tea. People asked very educated questions about tea cultivars, methods of tea production, and optimal brewing tips. I was delighted to share and see reactions to Ruby 18 as a cold brew. For people who exclaimed "I don't like black tea" we certainly won over many coverts. Ruby 18 is a cultivar developed in Taiwan by pairing a wild Taiwanese tea tree Camellia formosensis with a Burmese Assam (C. sinensis var. assamica.) People were very interested to learn more about this special tea. Cold brewed, it has enticing and rich layers of honey notes and a lingering finish. Overall, I think the Portland Tea Festival is a great example of a consumer-facing tea festival done well. It had the right mix of settings, vending styles, and educational opportunities that kept many folks around for nearly the entire day. I enjoyed the opportunity to meet and continue to build relationships with far-flung tea friends in the Pacific Northwest. Of course, a huge highlight was meeting my Tea Sister @teavoyeur !! We go for the people, and tea people are truly the best. See you at the Northwest Tea Festival in September!